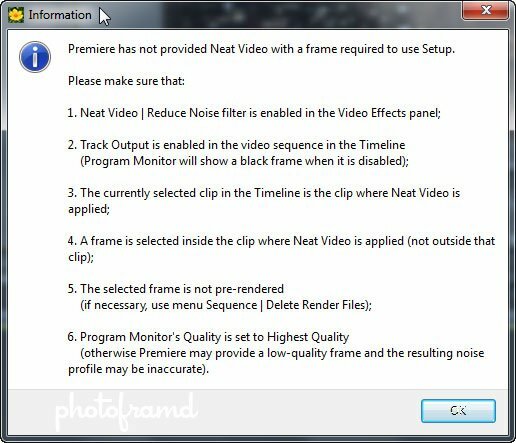 In my last article, I discussed the 64-bit Neat Video plugin for After Effects CS5. 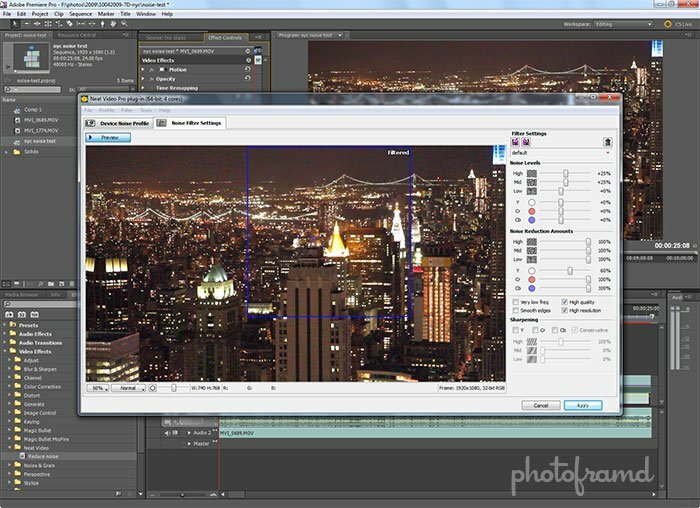 Well, if you are a Premiere CS5 user, Neat Video has another version just for you. In fact, their Premiere plugin will even work with Premiere Elements. The results are just as good as their plugin for After Effects CS5, so it provides you with a choice of program, platform and 32-bit/64-bit performance. if the area contains very weak noise (for example, in very bright area) and that makes it non-uniform; in this case, select another area with most visible / strongest noise that you can find in that frame, usually areas of medium brightness work best. Basically, just define another area for profiling which is mostly digital noise. I do want to mention, Neat Video provides great support! I emailed them several questions and received an answer within a few hours. Now this error message was a little more puzzling. When I clicked on the Options link, this box appeared. It turns out that I applied the Neat Video’s Remove Noise filter to a video which was not visible in the timeline. I just revealed the video and the plugin worked fine. One Note – the Neat Video plugin does not use your graphic card’s GPU for processing. It also does not support the Mercury Playback Engine, so the results take time to render and will re-render if you change any effects. However, Neat Video is a unique plugin in the Premiere universe and produces results which could save the day (or that video).